Cast from an olive stone, it weighs about 13 grams and is just over 20mm long. 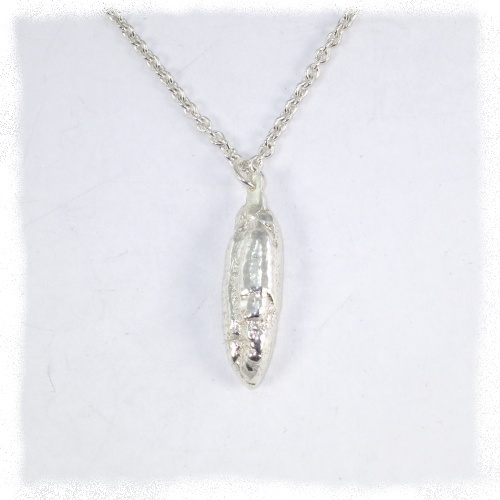 Complete with a silver trace chain. Olives stones are different and the chain in the picture is not a trace chain. Please contact me aif you would like a photo of the eaxct one that I will supply. Cast from a fresh but frozen chilli. It weighs 24 grams and is over 50mm long. It has a space for an initial. It will come with a 45 cm leather cord. Contact me if you would like a silver chain fitted. This should keep the vampires away – garlic and silver! Cast from a homegrown clove, it weighs 9 grams and is 10mm across. This comes with a black leather cord, but if you contact me I can supply it with a chain of your choice. 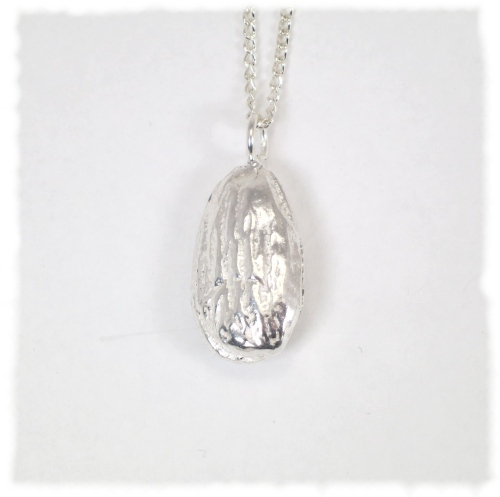 A solid silver pendant cast from an almond. This has an 18" fine curb chain. Other chains can be provided. 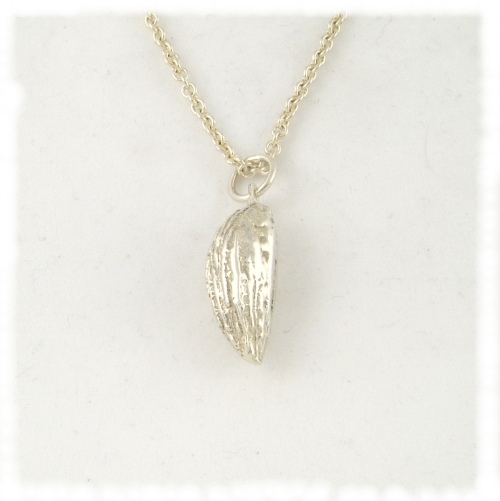 A cast of a date pip/ seed on a 16 inch trace chain. It weighs about 8 grams. 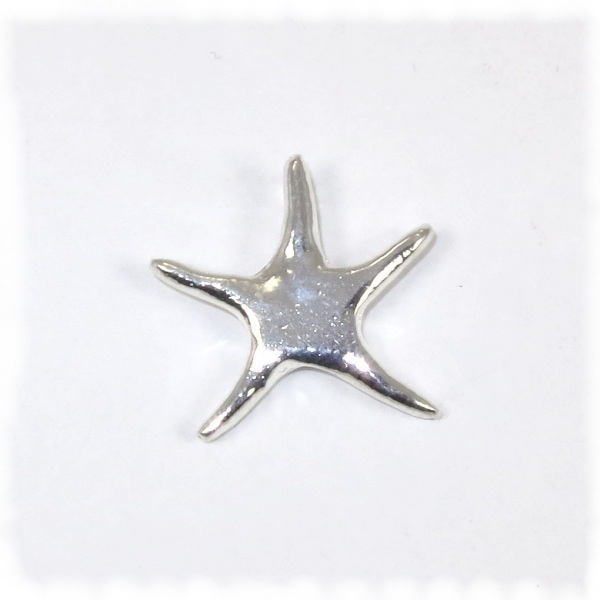 These are casts in silver of a plastic model of a starfish that I made.They weighs about 17 grams and are about 40mm across. They will come with a 40cm silver trace chain - there's a half loop on the back for the chain. The left hand one is a delft cast which gives a smoother finish. The right hand one was cast in a cuttlefish bone where the bone structure has transferred to the casting giving a unique ripple effect. 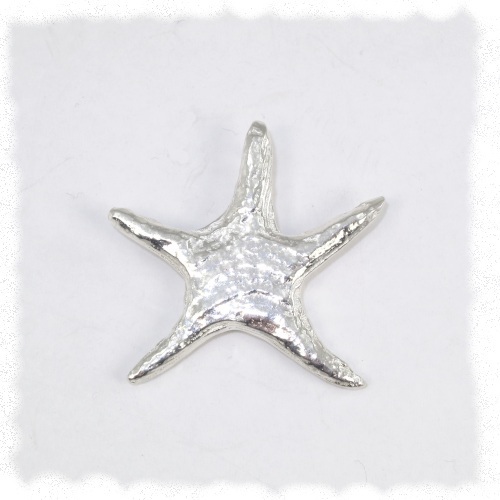 There's a smaller starfish below. They are all fully hallmarked on the rear. 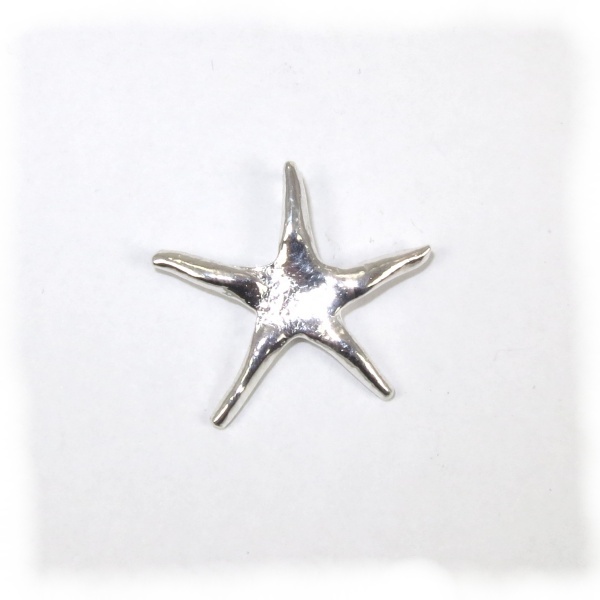 This is a cast in silver of a plastic model of a startfish that I made. It weighs about 7 grams and is about 35mm across. 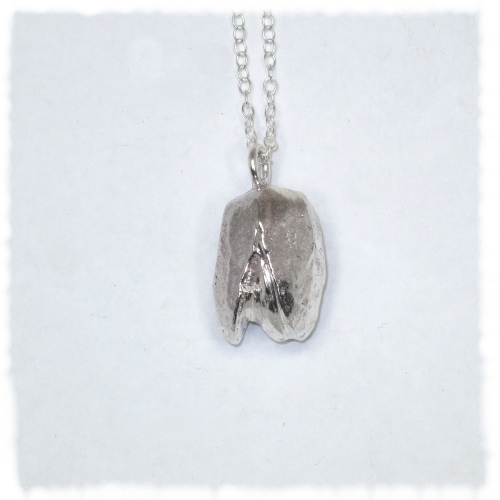 It will come with a 40cm silver trace chain - there's a half loop on the back for the chain. There are larger ones above. It is fully hallmarked on the rear. Please contact me if you would prefer a different chain. This is a cast of one of my wisdom teeth. It weighs 9 grams and comes with a 16 inch trace chain. 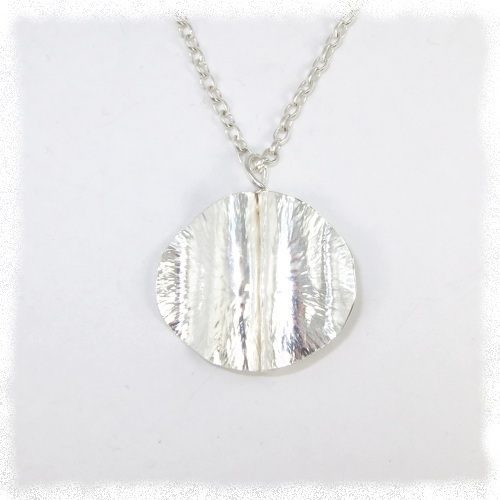 It is fully hallmarked. Please contact me if you would prefer a different chain. 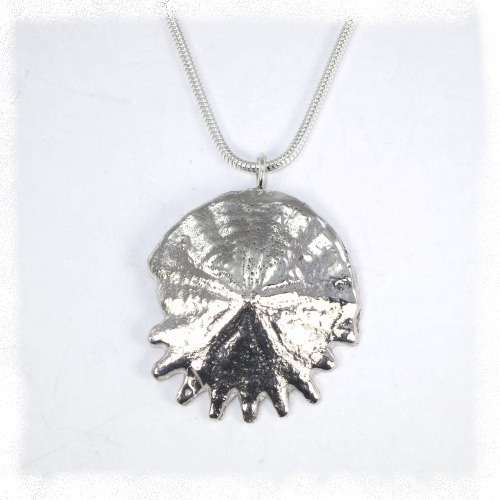 This is a cast in silver of an echnoid shell. You can see the five point marking in the centre. 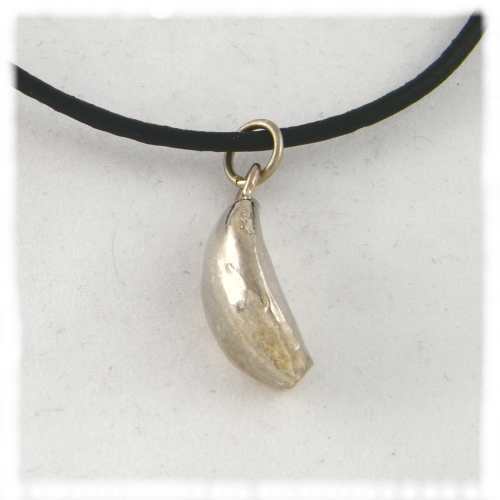 It is supplied on an 18 inch snake chain and weighs 25 grams. 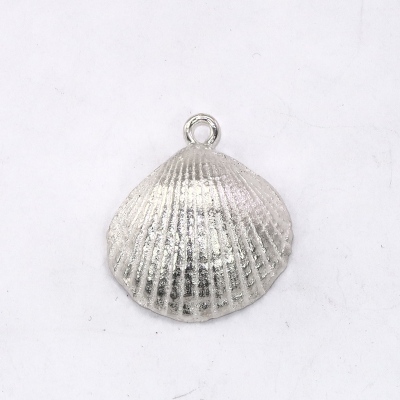 The shell is fully hallmarked on the rear. Please contact me if you would prefer a different chain. 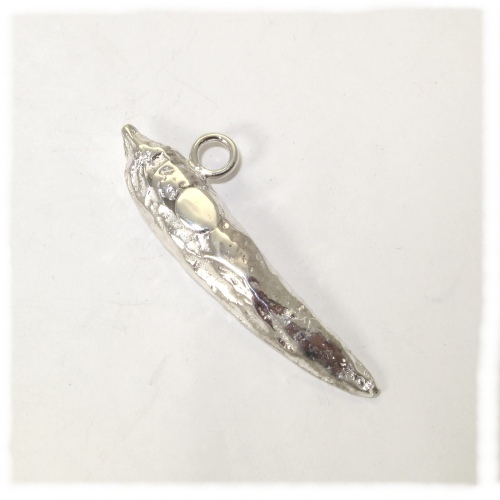 A large (45mm width) fold formed pendant.It weighs 6 grams and will be supplied with an 18 inch belcher style chain. It is fully hallmarked on the rear. Please contact me if you would prefer a different chain. This is a cast of a real sea shell. 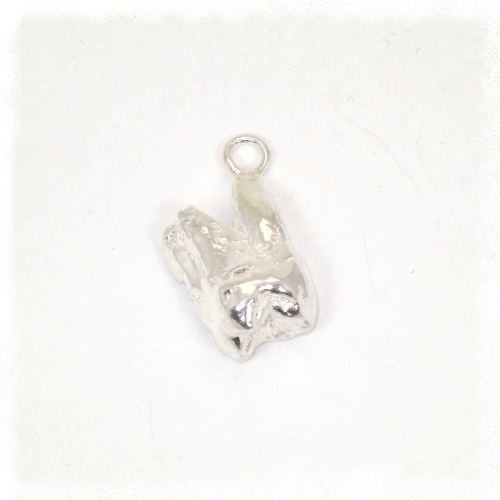 It is about 2cm by 2cm and weighs 6g. Itcomes with a 16 inch trace chain. Please contact me if you would prefer a different chain.